Does Language Shape Public Attitudes toward Gender Equality? Gendered languages require speakers to designate many objects as masculine or feminine. Genderless languages do not assign most objects a gender. Do these syntactical differences have political consequences? 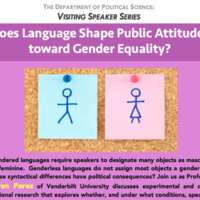 Join us as Professor Efren Perez of Vanderbilt University discusses experimental and cross-national research that explores whether, and under what conditions, speaking a gendered language can affect support for gender equality.